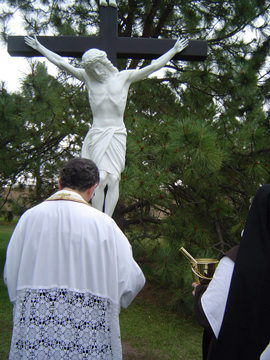 October is here, a special month in the Carmelite year for a few good reasons. October, as you know, is the month the Church dedicates to Our Lady of the Rosary. The Blessed Mother of God is the very emblem of perfection and holiness for every Carmelite, and any honoring of this gracious Mother gives us joy. To read just a bit about the rosary and its history, please see our Holy Rosary page in the Catholic Devotions section of our website. 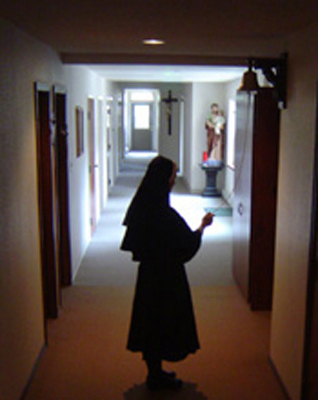 The daily recitation of the Holy Rosary, whether in private or in common, is a highlight of each of our days in Carmel. It is not an easy prayer for everyone, but a good method of praying the Rosary is to remember that you are praying to God in union with the Holy Virgin. Who would not want the privilege of praying with the Mother of God? And who cannot benefit from doing so through this favorite of her prayers? You may also benefit from the excellent rosary guidebooks we offer, especially St. Louis de Montfort’s Secret of the Rosary. October also brings us to the celebration of the feasts of the “Two Teresas”: Our Holy Mother St. Teresa of Avila and St. Therese of the Child Jesus. As Carmelites, we are astonished when we think back to our childhood and reflect upon the influence these two holy women would have upon us. How could we have known then that they would become such key figures in our lives? Some of us recall that our parents and teachers tried to keep the two saints distinguished one from the other by calling them “Big Teresa” and “Little Teresa”. How different it is now, when we see and feel them really to be Our Mother and Our dear Sister in heaven. The Spanish Saint, with her zealous, practical love of God and lofty, but most humble, knowledge of the mystical life of prayer; the French Saint, with her surpassing trust in the Merciful Love of God and gift to us of the “Little Way” of confidence and humility… For these cherished directors in our path to God, we can never be grateful enough. October 8th of this year also marked the 20th anniversary of the foundation of our Carmel. Please join us in thanking the good God for the privilege of our vocation and His blessings on our community all these years! We continue to add quality items to our site and are amazed at how quickly people notice! We are especially pleased to have the lovely and devotional Sacred Suncatchers. They are like miniature stained-glass windows. In fact, each of the images used is an exact reproduction of a stained glass window found in some of the most beautiful churches and chapels in the country. Please also note the new gift rosaries we have added to our Rosary Gallery, especially the Baltic amber and the garnet with garnet cabochon pater beads. You know by now how strongly we recommend spiritual reading as a most beneficial practice for the progress of our life with God. Please see new editions of some of the spiritual classics, now offered on our website: True Devotion to the Blessed Virgin, Introduction to the Devout Life, Self Abandonment to Divine Providence, and many others. Though it is hard to believe, Christmas is in the minds of many as the autumn season progresses. Our Christmas ornaments, Nativities and other decorations, many new to our site, are now available. Please return over the next weeks to see more new, lovely ornaments that we’re still adding to the site, including exquisite woodcarved ones from Italy and Germany! As promised, we carry on our custom of featuring certain books that the Sisters recommend for excellent spiritual reading. The Little Manual of Perfect Prayer and Adoration (1958—originally published as Living With God) by Fr. Joseph-Marie Perrin, O.P. So very many of you ask how our new vocations are doing. Are they well? Are they persevering? How are they adjusting? And the queries always end with a promise of prayers for them. 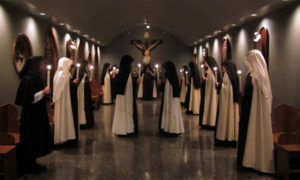 Well, happily all of our young vocations are indeed well and facing with alacrity and enthusiasm the varied challenges of a new life—the Carmelite life. As is the case with the members of any religious community, we all come from different backgrounds, and sometimes very different. Such is the case with the four young ladies presently in our novitiate. Some are city girls, unfamiliar with dirt roads, and some from more rural areas, where that’s all they traveled on to get anywhere! When it came to shucking corn as the abundance of harvest was brought to our door, our two postulants stood side by side to accomplish the task. Since the corn was fresh from the farm, it had its share of worms! The city postulant, with raised eyebrows and willing, but hesitant, hands, pulled away at her first cornstalk. And the country postulant took the stalk in hand like picking up a spoon. When the worms showed their presence, the reactions were typical to the girl—but all in obedient silence, with warm, teasing smiles and happy hearts. Besides learning the humble tasks of the kitchen, there comes a day when every postulant must learn the ropes of ringing the various bells in the monastery. An announcement is made to all the community to ignore the bells for the next half-hour or so, and with that warning follows the sometimes entertaining manner in which a neophyte clangs away in her first attempt at ringing a bell. Not only bells, but “clappers” are used for sounding an alert: large clappers for waking the Sisters in the morning, small clappers for halting conversation at recreation for a short Spiritual Communion. The Sister who is Bell-ringer for the week, whether young or old, never sleeps soundly through the night. Her awareness of her duty keeps her always a bit on edge, and the sometimes frequent wake-ups has her making middle-of-the-night checks of her clock to make sure she has not missed the correct time to perform that duty! But recently one of our postulants was so very attentive to her duty that she clapped the community awake about an hour after we had fallen asleep for the night! We rejoice in preparation for the clothing of one of these postulants: at the end of October, she will receive the Holy Habit of Our Lady of Mount Carmel. 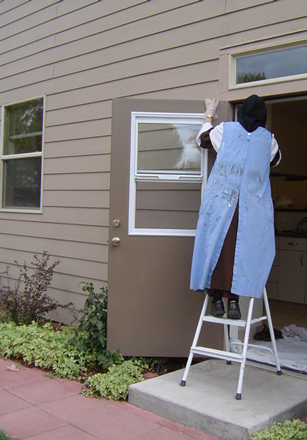 Therefore, sewing fills the day’s work-hours for about four of the Sisters now—including the postulant and others of her novitiate companions. As any seamstress will tell you, and as our young Sisters are discovering, sewing is approximately 10% sewing, with the other 90% measuring, cutting, pinning and, unfortunately, ripping out mistakes! How the virtue of patience is learned and practiced in the sewing room! 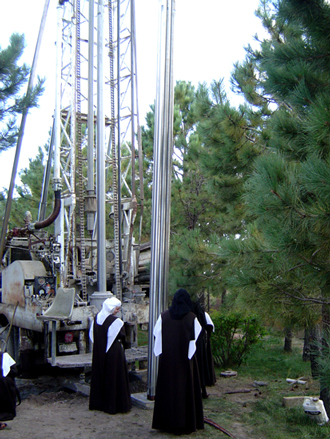 Other recent news and work of Carmel can be seen in the photos: the erection of a large outdoor crucifix on the enclosure grounds, the drilling of a second well for water, having three new storm doors installed (we learned the need for this after last year’s extra-severe winter! ), and adding a small fountain garden near our beautiful outdoor St. Joseph. Of course, there is the ongoing care and beautifying of our enclosure—moving plants, watering trees, weeding, and pruning everything—a healthy, peaceful work. We promise not to let so much time pass before sending our next newsletter. Until then, please be assured of our prayers for you, especially at the Holy Sacrifice of the Mass each morning. P.S. Don’t forget that in just a few weeks November begins, the month devoted to prayer for the Souls in Purgatory. Please remember these holy, suffering, contemplative souls, who, though close to God, still await their entrance into their heavenly home. Assist them with your prayers and penances.